It was Scott Kelby’s third annual Worldwide Photo Walk on 24 July 2010 and I wasted no time in getting my name down for the Durban, South Africa, leg of the walk led by fellow camera club member Andrew Roos. Our walk took place in Point Precinct Area which includes some of the beachfront and buildings ranging from the ultra-modern to the seriously distressed. 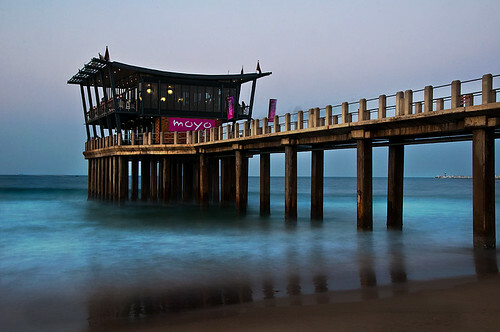 The walk started and ended outside Moyo Restaurant at Ushaka Marine World and I noticed that restaurant had established a second instance of itself on the end of the adjacent pier. I stuck a neutral density ND8 filter on the end of my 18-105mm lens and the 15-second exposure gave a misty effect on the waves that I liked, so I chose the shot as my entry for the Photowalk competition. Wow love the pier shot. I missed this year’s photowalk, so will have to wait for next year’s.